ART FOR LIFE CHICAGO is just around the corner, come Meet the 2018 participating artists and other art enthusiasts while enjoying bites and drinks! Get a taste of this years wildly interactive OFF THE WALL painting that will be available for purchase at our October 18th event. Raffle Prizes! Purchase One Day Only - Early Bird Tickets for $75 Discover DIFFA/Chicago OR LIFE CHICAGO! Join us for this exciting POP UP party - It's FREE! 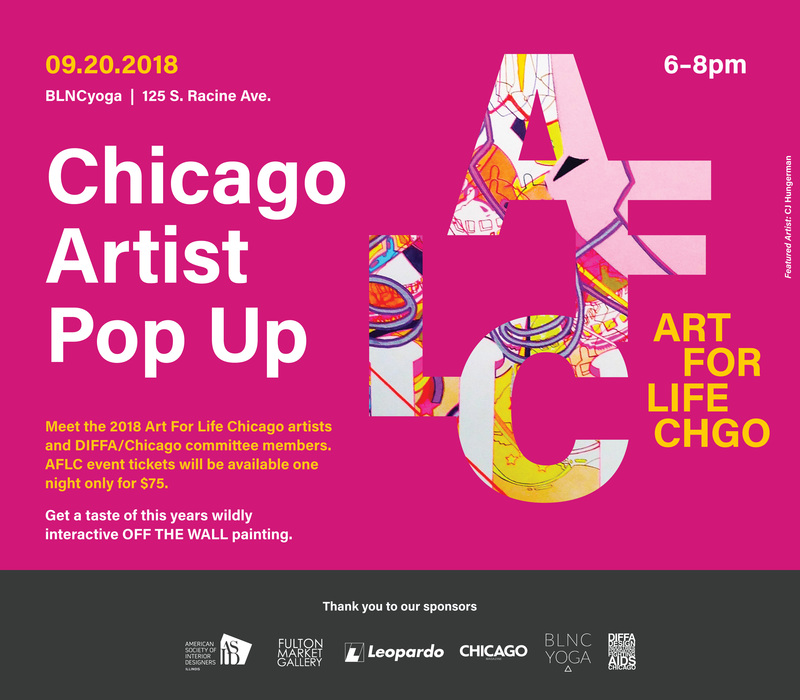 ART FOR LIFE CHICAGO is just around the corner, come Meet the 2018 participating artists and other art enthusiasts while enjoying bites and drinks! Get a taste of this years wildly interactive OFF THE WALL painting that will be available for purchase at our October 18th event. Raffle Prizes! Purchase One Day Only - Early Bird Tickets for $75 Discover DIFFA/Chicago & ART FOR LIFE CHICAGO! Join us for this exciting POP UP party - It's FREE! Thank you to the following supporters: BLNCyoga, Fulton Market Gallery, Leopardo Construction, Chicago Magazine and ASID IL.